Looking for a way to bring his family up in the country, away from the city, George Jenkins purchased a small chicken ranch in the Central San Joaquin Valley in 1967. Needing a business partner, he turned to his father-in-law, Chester McKim. 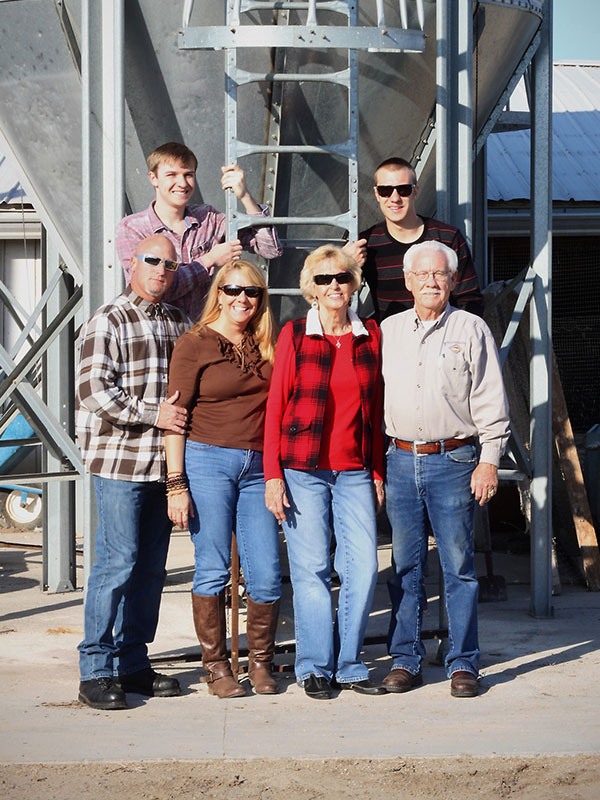 On this ranch, they raised chickens and provided eggs to a small processor in Ripon, California. Seeing the need for cage-free and organic-grown chickens, he converted the poultry and egg farm to become completely cage-free in 1995. Great Valley Poultry has been organic certified with Global Culture since 2004. Now, his daughter, Dana Corbin, and her husband, Arney Corbin, have taken over the farm and still believe in the need for cage-free and organic eggs. Their son Denton Corbin is currently enrolled at the local Junior College majoring in Poultry Science and Agricultural Business. This makes the poultry and egg farm in Manteca, CA a four-generation farm that serves the Bay Area, CA and still going strong. Straight From the Farms to Your Plates! The eggs are sold directly from our farm to the customer at the farmers market. We process and package all the eggs right out of the chicken house. They could not be any fresher! We practice sustainable farming and reuse and reduce all waste at the farm level. We maintain small bird numbers in each flock to give personal attention to every flock on the ranch. Our organic birds are allowed to wander out of the house each day to stretch their wings and give them a chance to enjoy the fresh California air. We are fully licensed by the California Department of Food and Agriculture and inspected each year by our county agriculture department and our organic certifier, Global Culture. We maintain a strict quality assurance program to make sure you are provided with healthy eggs. We are also registered with the FDA. Our organic pastured birds have 24-hour access to some of the finest organic pasture in the San Joaquin Valley. They are free to roam as they choose. This gives our pasture the best fertilizer nature has to offer. These birds are fed organic feed and free from GMOs. All of our hens are also offered a nutritious corn blend feed that ensures you are getting a great-tasting and nutritious egg. Our feed consists of corn, small amounts of soybean meal, and just enough essential amino acids and lysine to ensure our hens are eating the right stuff to keep laying eggs to deliver to your family. Our farms are also certified humane through Humane Farm Animal Care, so you know our birds are treated well. Our number one priority is to keep all of our chickens healthy! These chickens are kept in a completely cage-free house. These are fed standard feed, which might contain GMOs. Our housing and treatment of our birds meet all CDFA, USDA and Humane requirements. These birds are kept in a completely cage-free house with access outside during the day and when weather permits. They are fed organic feed, which does not contain GMOs. Our housing and treatment of our birds meet all CDFA, USDA, Humane, and Organic requirements. These birds are kept on five acres of alpha pasture. We supplement their diet with a non-GMO organic feed. They have 24-hour access to the outside. Our housing and treatment of our birds meet all CDFA, USDA, Humane, and Organic requirements. These birds have 24-hour access to outside and are fed a standard feed which might contain GMOs. At Great Valley Poultry, our mission is to be a reliable source for delicious, premium-quality eggs. We partner with local farmers markets in order to make our egg products more accessible to individuals and families wishing to eat better. To learn more, feel free to get in touch with us.